Not long ago I signed up for an improvisational theater class. I thought I might gain stage presence and confidence; little did I know I would encounter a genuine cognitive challenge. Within seconds of stepping into a new scene, you must assign yourself a character, convey a location and jump into an activity. You must also react convincingly to your scene partner’s responses. Spinning a believable narrative out of two actors’ choices is like keeping a beach ball aloft no matter what awkward trajectory it may have spun off on. Learning improv has brought home two main ideas of this issue. Pursuing all the goals needed to improvise a scene can feel just as demanding as, say, answering an important e-mail while taking a phone call. Clearly, I am not a “supertasker”—one of those rare people who can flawlessly execute multiple challenges at once. Psychologists David L. Strayer and Jason M. Watson study these lucky individuals, and they share their discoveries in “Supertaskers and the Multitasking Brain." These themes are deeply related. 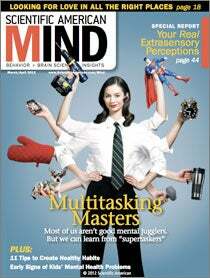 The act of multitasking alters how we perceive the world as we travel through it. Multitasking divides our attention, which forces the brain to discard critical sensory signals and influences how we think. To engage fully in an experience, however, all you need to do is focus.